This year Magda will drive a DA Racing Peugeot 208WRX SuperCar. 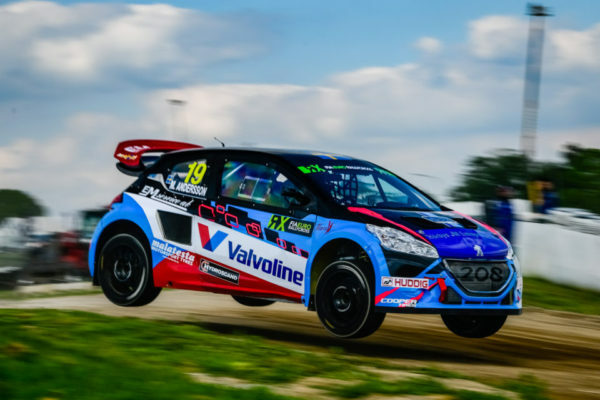 Originally constructed by Peugeot Hansen Motorsport and fielded in their 2015 WRX campaign this car boasts quintessential racing DNA. Powered by an ORECA engine, developing almost 600bhp, this machine is one of the most developed challenger’s on the SuperCar grid. Accelerating to 100kph in a mere two seconds this amazing example of race car technology is the perfect accompaniment to Magda’s smooth driving style. Chassis : Peugeot 208WRX built by Peugeot Hansen Motorsport to FIA European Rallycross Championship for SuperCars’ regulations. Engine : Four cylinder, two litre, turbocharged, transversely mounted, complete with FIA mandated 45mm inlet air restrictor, developing 600bhp and 900nm of torque built by ORECA. Geartrain : Four wheel drive. Triple plate, hydraulic clutch. SADEV sequential gearbox. Two number, plate type, limited slip differentials front and rear. Suspension: Fully independent with damping by Öhlins. Braking : Ventilated discs all round with 355mm diameter units on the front. Wheels : Aluminium 17” rims with Cooper Tyres. Weight : 1,300kgs FIA mandated minimum weight. Performance : Acceleration 0-100kph in 2 seconds. Top speed up to 190kph depending on gearset.